Spring is here (sort'a)! What better way to celebrate the changing of the season than to partake of that most quintessential symbol of Canadianness, maple syrup? 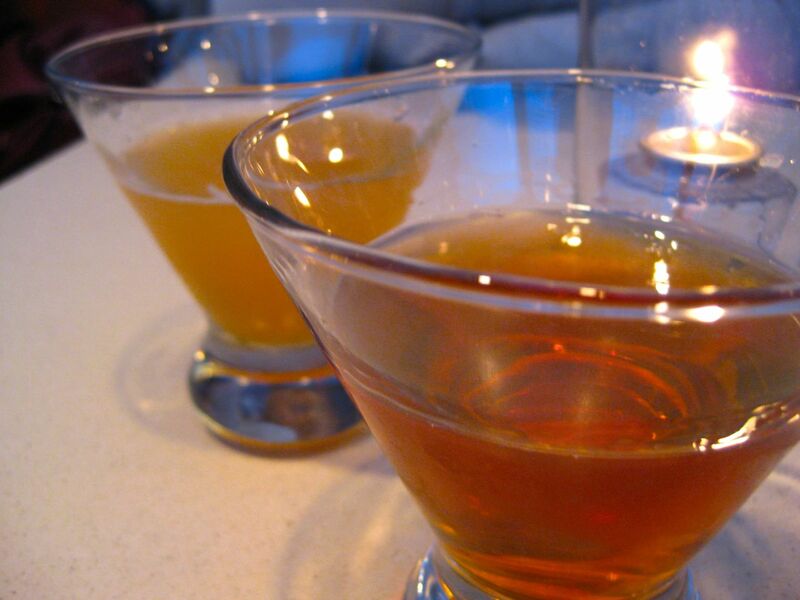 We sauntered to the Drake Hotel for their Maple Madness Festival, featuring boundless maple goodness. Our first stop was the Drake's General Store next to the hotel to try some Maple Cotton Candy. The cotton candy had the most intense maple smell you'll find. Spinning maple sugar does wonderful things that tickle your senses. Mmmm, that would definitely bring out the kid in anyone. A touch of heaven in clouds of sugar with with a twist. Into the hotel we go for some cocktails and our maple meal. We had an Apple Jack Rabbit (Calvados, fresh lemon and orange juice + maple syrup), and a Maple Me Tipsy (fresh ginger, maple syrup + bourbon). Both drinks were yummy and went well with the food, though Stacey insists that the Maple Me Tipsy was a "man drink" due to the definite kick of Jack. 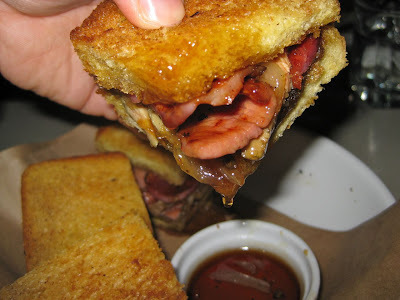 The most decadent sandwich I have ever tasted comes in the form of the BSBFG (brown sugar, bacon + foie gras). Anything with foie gras is an uber-delight anyway, but this takes fat and sugar worship to new heights. I couldn't help but think this sandwich was giving me a foie gras. Oh and the dip. The BSBFG came with a really dark, sweet and rich maple syrup, which must've been reduced since I've never had it that strong. Nom, nom, nom. Speechless... speechless! 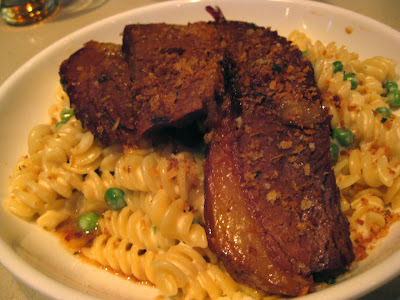 For the main course, if you could call the previous item an app!, we had Maple Glazed Brisket (w/ three cheese mac n cheese). Brisket is one of those cheap cuts of meat that is really not good enough for haute cuisine, but ironically offers the most satisfying flavour. You gotta love the fat! If a croissant were made of meat, it would be brisket. Honestly the meat was a little dry, but who am I to complain when I my palate was being bombarded by sweet maple and melt in your mouth bovine fat with a thin bittersweet crunchy crust. 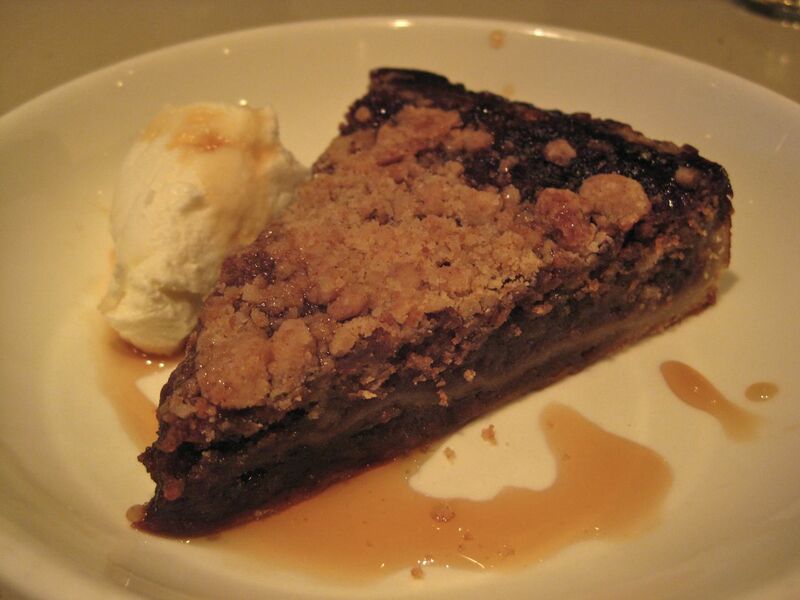 Dessert was Maple Sugar Pie (molasses + maple syrup). It looks a la mode, but it's not. We figure that white stuff was probably sour cream with either whipped egg whites or mascarpone. An interesting contrast of sweet and sour, although judging by sweetness of the rest of the meal, maybe dessert should've been the first thing to be served and the BSBFG last. Wow that was good. Time for a leisurely walk along Queen West to assuage the guilt and stave off duck liver nightmares. The Drake Hotel is located at 1150 Queen Street West (between Dovercourt and Dufferin). Visit http://www.thedrakehotel.ca or call 416.531.5042 for more information. 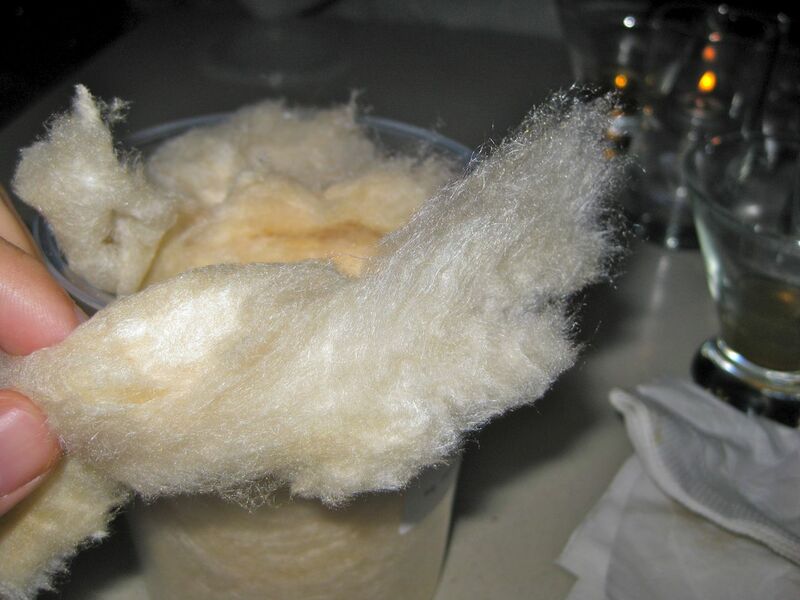 I'm not a big fan of maple syrup (yes, I know, heresy), but the maple cotton candy sure looks good. It would be a break from the usual flavor (just realised that I've never thought about what the usual flavor actually - I've always just called it cotton candy flavor). I think I need to bring 2 or 3 friends with me in order to finish the meal. The appetiser look big enough to be a main!